At a distance the mountain doesn't seem like much of a concern. The rate of elevation isn't too great. Sure, it's a long way to the top but that's just a matter of time. As you start the ascent you set an aggressive pace, but you can do this. Soon you come to the first turn in the road. You lean forward catching the drops and engage the full might of your quads as you feel the deceivingly slight increase in slope around the turn and you lose all your forward momentum. Now you know why this mountain is so tough, it's all the switchback siphoning off your momentum and with it depleting your energy reserves. So how do we simulate a "Switchback" on a Spinning® bike? That's easy, you add resistance. 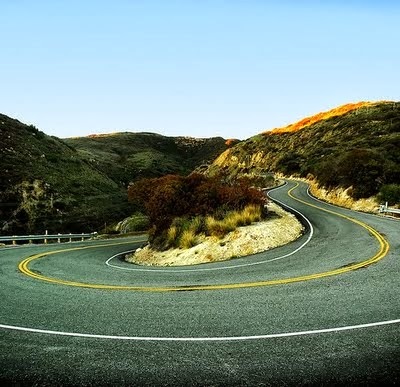 The question is how long is the turn in the road and how steep? So I coach switchbacks starting from either a seated (C)limb position or a (S)tanding (C)limb position. As you're progressing up the hill/mountain you cue the class that you're coming up on the first of several turns in the road and with each turn you increase resistance and lose momentum (cadence). These periods of higher resistance, slower cadence can vary from 15 to 30 seconds and then you return to the resistance just prior to the turn; cadence should follow shortly there after. In both cases you actually drop the resistance after the switchback turn, it's simply implied when I'm doing that from a seated climb to a standing climb. I also label that segment of the ride to be Switchbacks so that I have a reminder of what the terrain is.